The tabletop label dispensers from Dispensa-Matic are heavy-duty, semi-automatic electric label dispensers for labels from 0.375” to 6” wide x 0.375” to any length. They make it easier to grab a label from a roll to attach to boxes, envelopes, brochures, bottles, bags, cans – anything that needs a label. These dispensers are built tough to handle daily use for years of trouble-free service. Increase your production speeds and accuracy with one of these label dispensers. 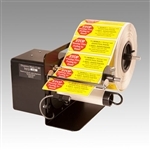 Dispensa-Matic U-45 Label Dispenser is a heavy-duty, semi-automatic electric label dispenser for labels from 0.375” to 4.5” wide. 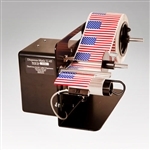 Dispensa-Matic U-60 Label Dispenser is a heavy-duty, semi-automatic electric label dispenser for labels from 0.375” to 6” wide.